OLE/DB Connection Info Dialog Box. SQL Server (2008 or above). Enter Name of the Project as MyFirstReport. Click OK. 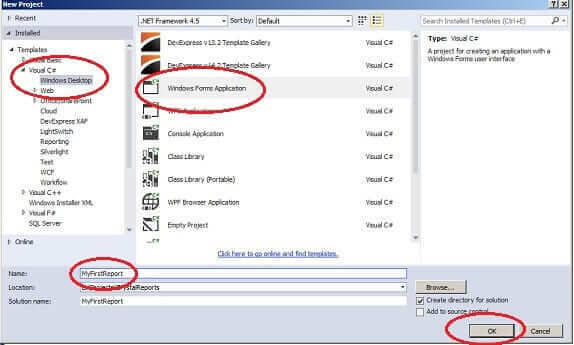 Visual C# Project is opened for you. Under Solution Explorer select your Project. Right Click and Add New Item. This displays the list of available templates. Scroll down to select the Crystal Report template. Enter the name as EmployeeList. Click on Add to Create your first Report. This will take you to Crystal Report Gallery. 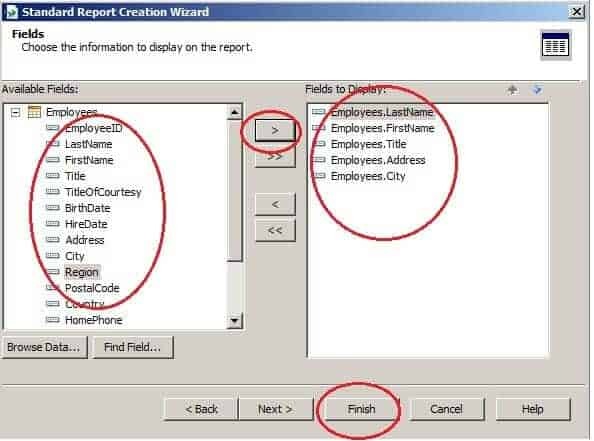 Selecting this option will open the crystal report wizard which takes you through the various steps to help you in creating the report. This will open a blank report. Here you are asked to select an existing report and the new report use. Crystal Report for Visual Studio comes with three report Experts. This expert will create the standard report. This expert will create a specialized report known as cross tab report. This expert will create mailing label report where data is displayed in a format that is suitable for use as address labels on envelopes. 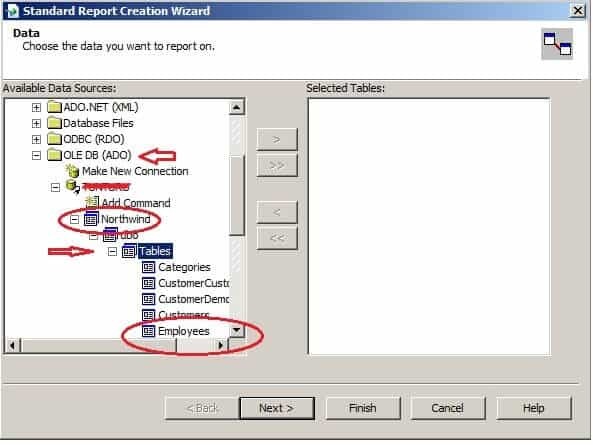 In this example let us select Report Wizard and Standard Expert and then click on next. 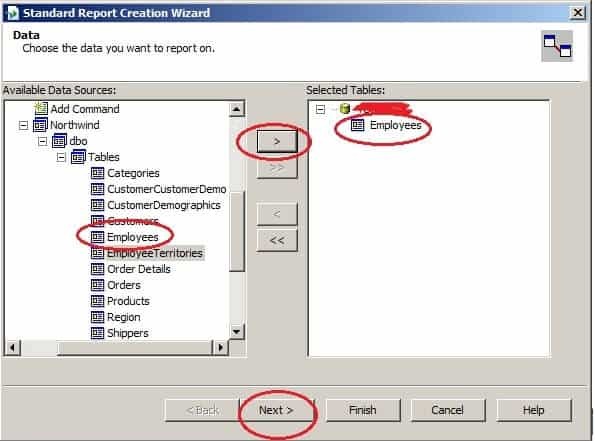 You will be taken to the Standard Report Creation wizard. This Option lists the data source connections already available in your project. This Option lists the most recently used data source connection so that you can quickly add it your report. 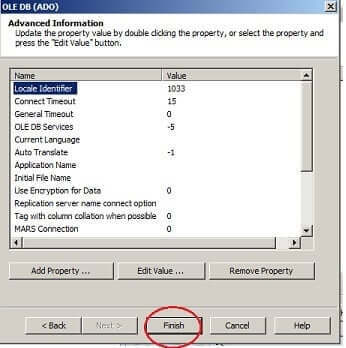 This Option allows us to create a new connection to data source. Let us Select OLE/DB option to connect to our data source. click on the plus sign right next to OLE/DB option. This will open the OLE/DB Dialog Box. This Dialog Box Option displays the list of available OLE/DB Providers. Choose the appropriate OLE/DB Provider to connect to your data source. 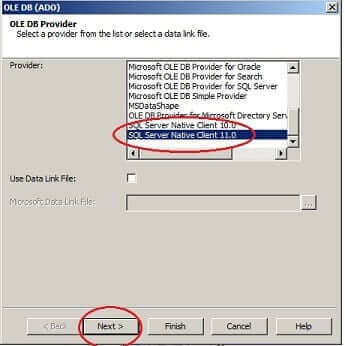 Let us chose SQL Server Native Client 11.0 which is used to connect to the SQL Server Database. Click on next. You will then see OLE/DB Connection Info Dialog Box. Here you need to input the database credential to connect to the data source. Input server Name. You can either input the user id and password or choose Integrated security option. If you choose User id and password, then the crystal report will ask you for user id & Password while displaying the report. I will choose Integrated security. Select the database from the drop-down. select northwind database. Click on next when you are done. You will then see OLE/DB Advance Information Dialog Box. Make appropriate changes if any and click on Finish to go back to Standard Report Creation wizard. Northwind data connection we just made is displayed under OLE/DB option under Create the new connection. Click on plus sign to expand to the database. 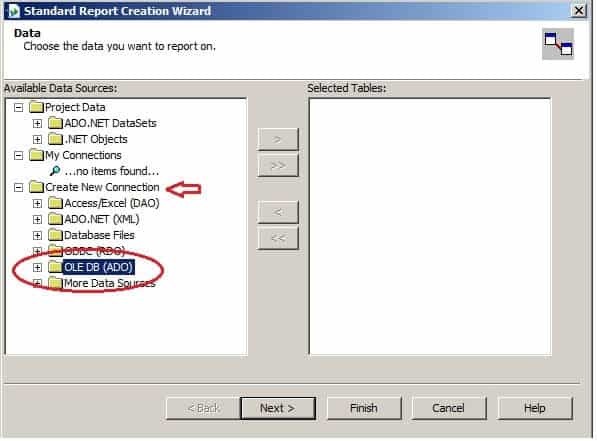 Any Tables, Stored Procedures, Views under the selected data source connection is automatically displayed under the connection and is available to the report. Select the appropriate the table/Stored Procedures/View which you want in your report. Click right arrow key to add the table to the report. The table will appear in the selected tables box on the right side. You can add more than one table to report. Click on next. You will be taken to Fields Dialog box. On the left side, you can see the list of fields from the employee table. These fields are now available to the report. You can select any field just by double-clicking on them. Selected fields will appear on fields to display box on the right side. Select any field on the left side box and click on browse data and view the database values of the selected field. You can hold the control key and select multiple fields at once. Select FirstName, LastName, Title, Address, City. You can then click on right arrow key to add the fields to the report. The fields will appear on the right side box. You can move the field up and down by dragging the fields or using up or down arrow buttons. Place the fields in the order you want them to appear in the Report. Click on finish. You will then see the crystal report designer and the report is generated for you. The next step is to show the crystal report in our windows form. To do this, you need to add Crystal Report Viewer control to the form. CrystalReportViewer Control is a usercontrol class and can be used as any other user control class. Primary Function of is to Display Reports. Open the form frmcrystalreport which we have created. Locate Reporting tab in the toolbox. CrystalReportViewer control is listed under the Reporting Tab in the toolbox. So go to the toolbox and locate the reporting tab. Select the crystalReportViewer drag and drop it unto the form. Good, now we have added the control. Go to the code-behind class. Under the form load event write the following code (Double click form header to create the event). Declare a variable rpt to hold the instance of the employeeListemployeeList is the name of the report which we have created. 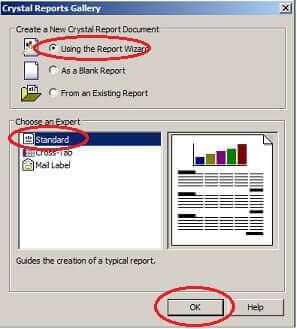 Assign this to the report source property of the crystal report viewer control. The code will look like this. 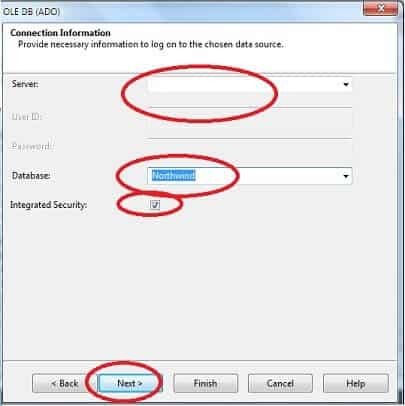 If you have not selected Integrated security when creating the data source you may be prompted for the database user id and password. Just enter the user id and password to see the report. CAN I USE CRYSTAL REPORT IN DOT MATRIX PRINTING? 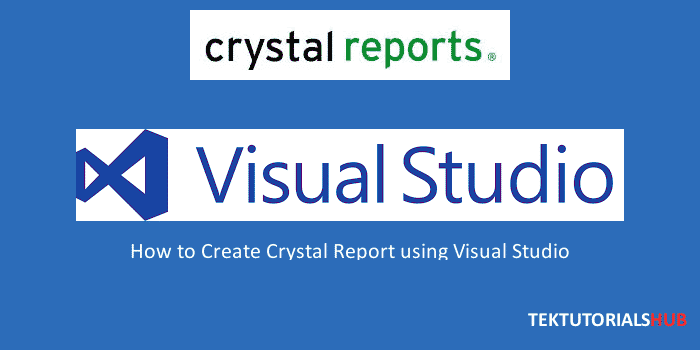 I am using this tutorial to learn how to create Crystal Reports using Visual Studio 2010. I know SAP Crystal Reports (stand alone version) quite well, but this is my first experience with CR for VS. I have successfully downloaded the files you recommend. I have successfully created the Crystal Report shown in the example. But I cannot add the Crystal Report Viewer. I see “ReportViewer”, but not “Crystal Report Viewer”. There are build errors and it seems some references relating to “CrystalDecisions” are missing. What references are missing and how can I add them? 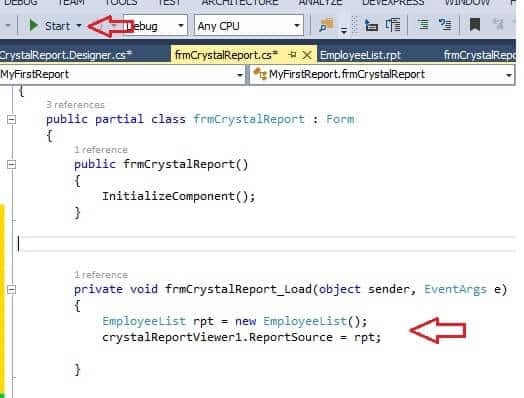 When I work in C#, I can see the Crystal Reports Viewer in the Toolbox, provided I select .NET Framework 4 in the form properties. 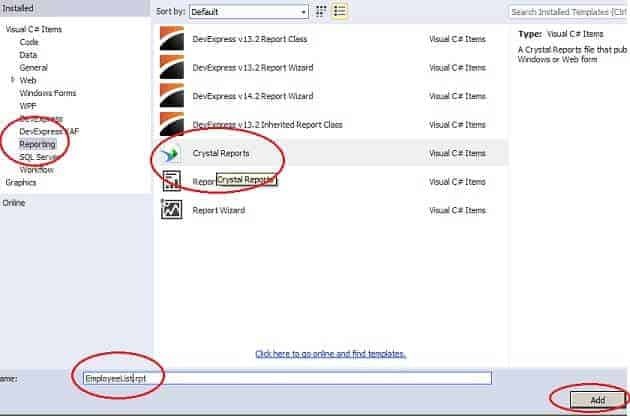 But if I work in VB.NET, I cannot see the Crystal Reports Viewer.